Handcrafted sneaker with elevator system to choose from 2.4 inches (6 cm) up to 3.1 inches (8 cm). 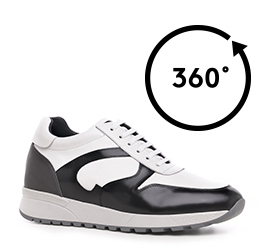 Upper in white full grain leather with details in black shiny calfskin on the toe and sides and grey heel counter. The black & white color contrast will add a touch of style to any outfit.